A controversy arose among the localpeople as to whether Baba was a Muslim or a Hindu. At one time, He used to say ,"Allah Malik! Allah Malik!" At other times, He would say, "Dattatreya Malik". Whenever He shouted "Allah Malik", Muslims used to come to Him in the Masjid. His appearance was very much like that of a Muslim. Hence, many Muslims used to come to Him. Hindus also used to come and offer incense to Him. The Muslims did not approve of what the Hindus were doing. The Hindus did not like the way Muslims revered Baba. Consequently, bitterness developed between the two communities. One day, Mahalsapathi was sitting near Baba and doing some service to Him. Mahalsapathi was the priest in the Kandoba temple. The Muslims who were opposed to the presence of a Hindu priest near Baba, came with sticks and beat up Mahalsapathi. At every stroke, Mahalsapathi cried out, "Baba! Baba!" Each time he shouted the name of Baba, the blow was borne by Baba. Mahalsapathi fell to the ground. Muslims had great reverence to Baba. Baba roared at the Muslim crowd, "Saitan! On one side you worship Me, and in the other, you beat Me. Is this your devotion?" Baba was bleeding all over the body. The Muslims saw it and asked Baba who had beaten Him. "Did you not beat Me?, said Baba pointing to several men in the crowd. They said, "We did not come near you at all. We only beat Mahalsapathi." "Who is Mahalsapathi? I am in him," declared Baba. "He has surrendered to Me and hence all his troubles are Mine!". On hearing this, the Muslims fell at Baba’s feet and craved for His forgiveness. Baba then summoned the Hindus and Muslims and told them, "Dear children, you are all the progeny of one mother." Thereby Baba demonstrated the fatherhood of God and the Brotherhood of man. He wanted all differences of caste and creed to be eschewed. What mattered for mankind was the heart. "You must seek Divine within you. Baba pointed out that all caste distinctions are related only to the body. Therefore, you should seek the Supreme in your inner consciousness." He advised. One day, a pundit came to Baba and said that Baba’s biography should be written. His name was Hemandpant. He is the author of "Sai Sat Charitha." He entreated Baba to disclose facts about the place of His birth, His parentage, His name and His early life. He could not get any information from any one. Baba did not reveal anything to anyone. But, on one occasion, when He was alone with Mahalsapathi, Baba disclosed His date of Birth to him. Mahalsapathi was no scholar. He had learnt only a few mantras to conduct the pooja in the temple. He noted down the date of birth on a piece of paper. This came into the hands of Hemandpant. With this, he began to write the life of Baba. No one knows the real truth about Baba. The world knows facts about His life only after His 16th year. He was born on September 28, 1835 and attained samadhi on Vijayadasami day in 1918. During His lifetime He taught many things to the people and performed many remarkable deeds. He was worshipped by many devotees. Dada, Nana, Shama, Abdul Baba, Mahalsapathi, Chandorkar and Das Ganu were always with Him. Abdul Baba was active till recently. He was an ardent devotee of Baba. In his view, it did not matter to what religion one belonged. All were one in their devotion to God. Kaka Dixit was a judge whose son stayed in Brindavan (Whitefield) for twenty years. Kaka Dixit maintained a diary in which many facts about Baba have been recorded including His statement about when He would pass away. In My (Sathya Sai) previous body (as Shirdi Sai Baba) every one was taught thorugh actions. For example Damu and Nana were rendering service to the Lord (Shirdi Baba). Baba collected a few copper coins and was playing with them, by tossing them from one hand to another and also testing them in various ways. He appeared to examine them individually. He did not exchange any word with Damu and Nana. He went on playing with the coins for half an hour in this manner. Curious to know what Baba was doing, Nana asked Him why He was scrutinizing the same coins again and again. Baba replied, "Baba, dear son, It is true that I (Shirdi Sai) am repeating the same action again and again, repeating the same words. Look at that mango tree in front of you. It is in full bloom. The leaves are hardly visible. If all the flowers in the tree were to become fruits, will the branch be able to bear the weight? But, it does not happen that way. Most of the flowers are swept away by the wind. Many others drop of their own accord. Only some of them become fruits; of these, some are eaten by squirrels, birds or monkeys. In this way, ninety percent of the flowers do not result in fruits. Only ten percent remain on the tree. It is not so??" "In the same manner, thousands of devotees come to Me. Are they all ripening into good devotees? Many drop away in the middle. Some come for getting their fulfilled. Some seek wealth. Many come either for study or in connection with jobs, marriage or other personal desires of their own. In each of them, there is some defect. No one comes for My sake. I have precious things to offer in My coffers. But no one seeks them. It is for this reason that I am examining them (coins). Among these coins there are some which are worn out; some which are debased and some which are twisted and worthless. Just as I am examining the defects in these coins, I am also looking for the defects among the devotees who come to me. I am trying to find out what defects are there in these people, and whether they can really comprehend My truth with those defects. They want Me, but all their desires are related to mundane objects. How can they attain Me with this attitude? How can you reach your destination if you get into a train going to some other direction? They want Me, but they do not make efforts for realizing Me. Among the many who come to Me, it is only one in thousand who really makes the efforts to realize Me. The minds of the so-called devotees are turned in the wrong direction. If their desired are fulfilled, they praise Me. But, once a desire is not realized they go to the extent of even reviling Me. Even while they are attempting to understand Me, they harbor doubts from head to foot. Some leave Me when their worldly desires are not fulfilled. They are not sincere devotees at all. They are in fact worse than sinners. How can they reach Me? ", said Baba. 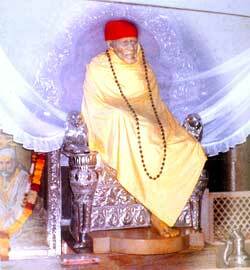 Once a wealthy man came with lot of money to Shirdi Baba with the object of gaining Brahmajnana, the supreme wisdom. He boasted about his wealth. Baba asked him "How long will you be here?" He replied that he had come by a taxing fixing to and fro charges and had to return in a day or two. Baba said, "When you have greed for wealth, how can you realize God? It is not a goal that can be accomplished in a fixed time. Get away?" Baba noticed that he was still sitting and became furious. He chased him out, wielding a stick. To one who sought His grace with purity of heart and selfless devotion, Baba conferred His grace abundantly. Mathaji Krishna Priya was one such devotee. Living in Nagpur, she used to worship Krishna and considered Baba as another form of Krishna. She frequently visited Shirdi to seek Baba’s blessings. Once, Dada’s wife brought her child to Baba with intention of staying for some time at Shirdi. She got her husband’s reluctant approval for the visit. At that time, plague was rampant in Shirdi. On the second day of her arrival the child developed fever and had boils all over the body. The mother felt sorry that she had not acted on her husband’s advice and lamented as to who would protect her child from the affliction. She immediately rushed to Baba and cried aloud, "Baba! Baba!". Baba asked her what she had come for, "Is your child having fever? Are boils present on his body? Not only the child but I am also having boils. Look at them." So saying He lifted His Kafni and showed the boils on his body. Mahalsapathi, who was standing near, exclaimed "Swami, what large boils are these?" He touched Baba’s body and found that He was running high temperature. The temperature might be as high as 105 deg. F or 106 deg. F. The mother cried, "Oh Baba! Has the disease affected not only my son, but also You? Who will protect you?" She was in deep distress. Baba said, "Is there anyone to protect the opne who is the protector of all?" The mother immediately begged for Baba’s forgiveness. A short while thereafter Baba’s fever came down. The mother returned home feeling happy. Se saw that the fever and boils had vanished from her child also. She exclaimed, "Baba! Did you take on my child’s illness?" In the same manner, Shirdi Baba used to demonstrate His powers as and when the occasion arose. What was the reason for this? It was solely due to the total faith (Paripoorna Viswasam) which people had in Baba. The devotees followed implicitly whatever Baba directed them to do. Around the time when Sathe left Shirdi, the parents of Shyam came to Shirdi with a two year child. Shyam’s father had just retired from service and decided to settle down in Shirdi. The boy’s name was Mohan Shyam. The parents called him Mohan, while others called him "Shyam". The boy was put to school at Shirdi and in due course e completed his studies and received training as teacher. He was appointed as a teacher at Shirdi. The school adjoined Baba’s room. During the day, Shyam would be teaching at school. There was a ventilator in the wall separating Baba’s room and the classroom. Shyam used to watch Baba at nights through the ventilator. He used to notice Baba talking to Himself, getting angry at times, or laughing to Himself, or doing other curious things. Baba used to sleep on an eighteen-inch wide plank suspended from the ceiling. Shyam was apprehensive that Baba might fall from his lofty, but narrow perch during sleep. Once he mustered courage to ask Baba, while massaging His feet, "Swami, You don’t seem to sleep at all at nights. You are laughing to yourself or talking; what is the secret of all this?" "You simpleton! Do you imagine you are the only person about whom I am concerned in this world? There are numerous persons who are praying to Me. I am speaking to all of them", replied Baba. "When I turn my finger, I am turning their minds. When I move my lips, I am talking to them. Wen I laugh, I am amused at their follies. These are the things I am doing for my devotees, dear child." Shyam prayed to Baba, "Swami, my classes don’t take up much of my time. Let me stay with you during the rest of the time and serve you." At that time, there was a woman called Lakshmi Bai who used to cook food for Baba. Shyam used to go to her and assist her in the preparation of jowhar rotis. Baba had a great liking for brinjals. Shyam went to Lakshmi Bai to learn how to prepare brinjal dishes. Shyam went on serving Baba in this way and he alone knew the joy he derived from such service.